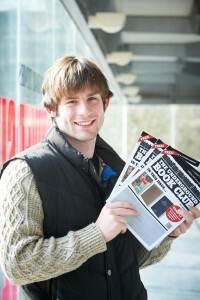 Andy Brown who recently won the SETsquared Student Enterprise Awards in the Best Student Start-up category with his business, The Underground Bookclub, has now won Sky 1’s The Angel. Andy has raised £100,000 of business investment as a contestant on Sky 1’s The Angel, screened on Tuesday 21 August. He triumphed against four other young entrepreneurs to secure the investment from John Caudwell, best known as the founder of high street mobile phone chain Phones4U. Andy survived a series of high pressure rounds which combined individual tasks, head to heads, group challenges and a grilling from John designed to test his six golden business attributes: drive, ambition, passion, resilience, commercial intellect and leadership. The Underground Bookclub provides commuters a metro-style free magazine but instead of news, it has the first few chapters of new books to try and perhaps buy.